Defining Key Information on Leads · You Don't Need a CRM! Every time you create a lead – on a spreadsheet or in a CRM system – you add columns or fill in existing fields. You need to do so because you're required to structure the information of your leads. You need to separate the "Name" from the "Email", and the "Phone Number" from the "Address", and so on. It’s just how it's always worked with CRM. Inside no crm.io you can personalize this structure by defining what fields make sense to your company and keeping only the essential information. Furthermore, this feature is key because when you export information, it’s the information contained in those fields that will be exported properly. Thus, it’s important that the columns inside the Prospecting Lists and the fields of your website’s contact form correspond to those created in the Admin > Default Fields page. 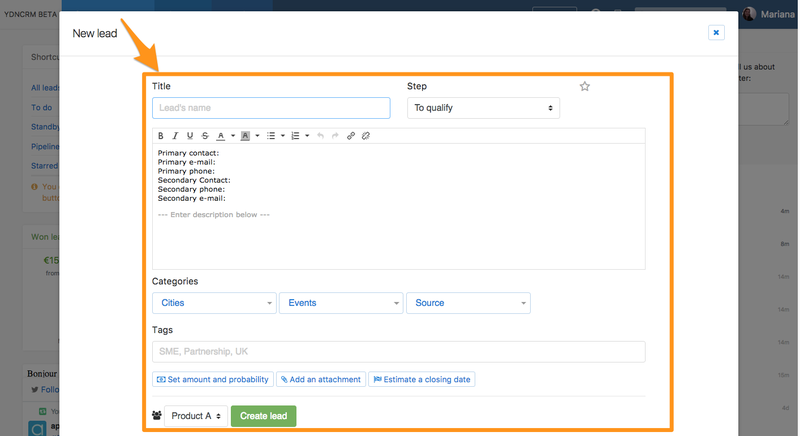 For the leads to have a limited amount of fields, we recommend that you instead use categories and tags. If you work in three cities: for example, NYC, Miami & London. Here, one category should be "Cities", and inside you should add three different tags, one for each city (there's more information on this in the next article). For practical information, please consult the Help Center section on this subject.